Anyway, this breakfast just kind of happened. I had some leftover potatoes and then remembered that I had some chicken sausage I needed to use up so it was the perfect combination. I am not a fan of any store-bought breakfast sausage right now because they are all so heavily processed but there are others that are not advertised as breakfast sausage that will certainly do the trick. The ones I've been getting are Al Fresco with spinach, garlic and fennel seed. Delicious (all natural and a gluten free casing). This was a definite make again, especially after a run and before a hike (I know I'm working on the whole calm down and relax thing. Soooo EASY! I used two separate pans so that i could prepare my eggs over-easy (yolk popped), but you could toss it all into one (coat with EVOO) and do a scribble. Prepare your eggs as you'd like, add in the turmeric. Heat up the chicken sausage and potatoes with parsley, sea salt and fennel fonds. I've gone through many phases with many foods. I love them for a while, I hate them for a while, or I am indifferent to them for a while. But not pancakes. No, through all of the years and experimenting with different foods and diets, my love of pancakes has never faded. Oh dearest pancakes, I will love you 'til the end. I could eat pancakes right now. And, I had some for breakfast this morning. In fact, I've had pancakes for breakfast every morning now for about a week. Yep. True story. Simply combine all ingredients together, the water will vary depending on if you've used a bit more or less pancake mix and how thick or thin you prefer them. You can play with the amounts a bit. Heat your skillet to medium with some EVOO (or any other oil you like), form two-three pancakes on the skillet and turn down to low-medium. Cook for about three minutes, flip and cook another three. I like to flip them again and do another minute on each side. These are even a bit more hearty, I usually have these on my days off... and sometimes add blueberries or raisins. And eat them very, very slowly... savoring each and every bite. By the way, the turmeric and spinach are both very subtle I love the taste of both ingredients but you really cannot taste them very much so if you are not a fan, try it anyway - you may be pleasantly surprised. Fabulously simple. Thank you sweet sister of mine for inspiring this one! I love experimenting. So, I figured that I would try another vegan bread. Yes bread with no yeast... or eggs. I am calling these 'Homemade Mustang Bars' because I got the idea from Paleo Treats. Note, I have not actually had their 'Mustang Bars.' And call me crazy, but I'm not going to spend $45.00 for 10 bars. But they looked interesting, so I looked at the ingredient list and made my own (omitting the almond flour and adding macadamia nuts). Obviously, I have no idea the portions that they used to make theirs so I basically did mine based on experience and what I had on hand. Well, my food processor is still taking some time off so I mixed this together by hand. Simply add all of the ingredients in one by one in the order that it is listed above, mixing the melted (30 seconds will do) coconut oil and honey in last. Form bars and wrap in cellophane and store in the fridge. Now, having had these, I will say I would definitely pay $4.50 for one bar. So, mad props to Paleo Treats. I may have a subconscious mission in life to come up with as many waffle recipes as I can conjure. I love waffles. Everything about them and the fact that they are a popular breakfast item just makes them that much more appealing to me. These waffles are not super sweet which is what I prefer (you could add some honey or maple syrup to your batter). I paired mine with berries (and topped with an egg). Heat your waffle maker to desired baking temperature/level. Mine has 5 levels and I set mine to about 2.5). Rub some coconut oil on the irons first if there isn't any remaining oil from the last round, I find I need to do this about every third use to prevent sticking. In a large mixing bowl, whisk the eggs, apple sauce, vanilla and water. 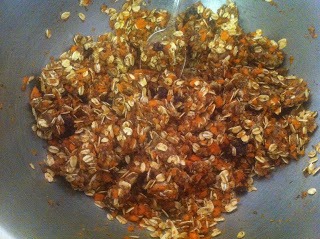 Blend well and then add in the brown rice flour, almond meal and flaxseed. Stir until all of the ingredients are incorporated. Add in the baking soda, apple cider vinegar and cinnamon, stir until a batter forms. Heat in the iron for about 2.5 minutes or until your iron signals that they are done. I am a big fan of huge breakfasts on the weekends. Big. Huge. (Those words will forever remind me of this scene from Pretty Woman). In a small bowl whisk together the egg whites until they begin to turn white but not frothy, set aside. In a large bowl combine the egg yolk, honey an vanilla. Add in the almond meal, lemon zest, lemon juice and strawberries. Mix well and then add in the salt and grapeseed oil. Once ingredients are well incorporated, add in the baking soda, apple cider vinegar and fold in the egg whites. Stir well until a nice dough forms. Grease tins with grapeseed oil and fill each tin about 3/4 full. Bake at 350° for about 25 minutes. I've yet to meet someone that doesn't like muffins...If you are out there, please don't let me know. These really are like mini pies. Mini raw pies of goodness. And they are not too sweet, so you may want to adjust the recipe to your liking. Shred the carrots in your food process, combine all ingredients in a large bowl and mix thoroughly. Roll into desired size balls and store in the refrigerator. Yes, totally love these ;) Perfect for a pre-work out energy boost. And what was created was quite delicious. Heat a large skillet on medium with coconut oil. Drop desired size pancakes onto the skillet and turn down the heat to low-medium. Cook on one side for about 4 minutes or until the top begins to bubble a bit. Flip and cook for about another 4 minutes on that side. Turn heat down to ow and flip and heat each side for about another minute. My favorite time of the day, and my favorite meal of the day. A heavenly combination. And so is the recipe below. Delicious. I paired mine with some fresh blueberries, strawberries and mint.